Ten Speed Press, 9781607743323, 600pp. Britain’s foremost food writer Nigel Slater returns to the garden in this sequel to Tender, his acclaimed and beloved volume on vegetables. With a focus on fruit, Ripe is equal parts cookbook, primer on produce and gardening, and affectionate ode to the inspiration behind the book--Slater’s forty-foot backyard garden in London. Intimate, delicate prose is interwoven with recipes in this lavishly photographed cookbook. Slater offers more than 300 delectable dishes--both sweet and savory--such as Apricot and Pistachio Crumble, Baked Rhubarb with Blueberries, and Crisp Pork Belly with Sweet Peach Salsa. With a personal, almost confessional approach to his appetites and gustatory experiences, Slater has crafted a masterful book that will gently guide you from the garden to the kitchen, and back again. Nigel Slater is the author of a collection of bestselling books, including the classics Real Fast Food, Appetite, and the critically acclaimed The Kitchen Diaries. He has written a much-loved column for The Observer for eighteen years and is the presenter of the award-winning BBC series Simple Suppers. His memoir, Toast --The Story of a Boy’s Hunger, has won six major awards, including British Biography of the Year, and has been adapted into a BBC film. 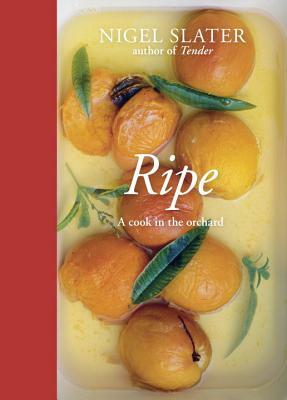 Ripe is the companion volume to Tender: A cook and his vegetable patch. Visit www.nigelslater.com. “This is so much more than a cookbook. With each chapter focusing on a different fruit, Slater offers tips on growing the fruit in your garden, characteristics of the most common varieties, how to handle them back in your kitchen, and tried-and-true ingredient pairings. Slater feels like a companion on a fruit-finding journey.